The recent surge in space junk created by anaccidental satellite collision last month has bumped up the upcoming spaceshuttle mission?s chances of taking a catastrophic hit, NASA officials said.However, the likelihood of the shuttle intercepting debris is still so low thatmission managers don't foresee any problems. Engineers analyzed how much danger would be posed to theshuttle Discovery's upcoming STS-119 flight, scheduled to launch March 11, bythe new debris, which was created when a U.S. and a Russian communicationsatellite unexpectedly rammedinto each other in orbit. The Feb. 10smash-up produced two large clouds of shrapnel that are now circling theEarth, NASA said. 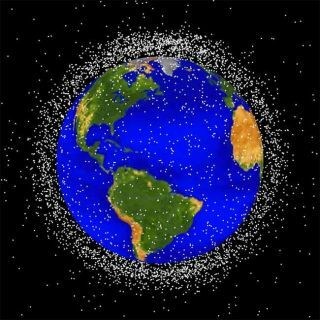 The investigation found that the newspace junk raises Discovery's risk factor by 6 percent, giving it a chanceof about 1 in 318 of being fatally hit by debris. Mission managers had estimated a similar figure shortly after the satellite collision, but said they had reviewed the risk in detail today. "That is very comparable to almost all ofthe 14-day missions we fly," said John Shannon, NASA space shuttle programmanager, at a briefing today. The collision occurred about 490 miles (790 km) overSiberia. Discovery is due to fly up to 220 miles (354 km) above Earth, where itwill dock with the International Space Station to deliver new solar arraywings. NASA is still assessing the risk to the upcoming Hubblerepair space shuttle mission, targeted to fly in late May. The danger to thistrip could be greater, managers said, because that shuttle is set to take itscrew to an altitude of about 372 miles (600 km), putting it much closer to therange of the collision than the space station is. "That didn't look so good, when they looked atthat," Bill Gerstenmaier, NASA's space operations chief, has said.